The holiday season is here and I’m sure you have some time off to hang with your kiddos this Christmas time! So here are some places to check out during this Christmas season, take your camera and go and make some memories! 1. See Santa at Macy’s Santaland (or elsewhere). I really enjoyed Santa Land at Macy’s. The wait was about an hour but don’t let that scare you away. Inside SantaLand you can take pictures and just enjoy the Christmas decor. Taking a picture with Santa is free but the picture packages start at $20. All Aboard with Thomas & Friends: – The Botanical Garden in the Bronx. I haven’t been to this show but I heard it’s pretty amazing. If your kiddos love trains especially Thomas and friends you’ll want to check out this show. Apparently this is one train ride you won’t want to miss out on. One of my favorite places. Standing underneath the tree always feels magical at night. So stop by and get some pictures and while you’re at it, make a quick stop at Magnolia Bakery, for some treats. My fave is their banana pudding. The most fascinating part about this toy store is their giant piano. Looking for a place that lights up your night ? You might want to pay this place a visit. The Garabedian family’s home on Pelham Parkway North is known to many as the Christmas House. Just one look and you’ll see why. This awesome indoor space offers a jungle gym to climb, crawl through, and clamber over. Splurge to see the high-stepping Rockettes do that famous kick line. Ruben took me to see this show when we were newlyweds. It’s outstanding! 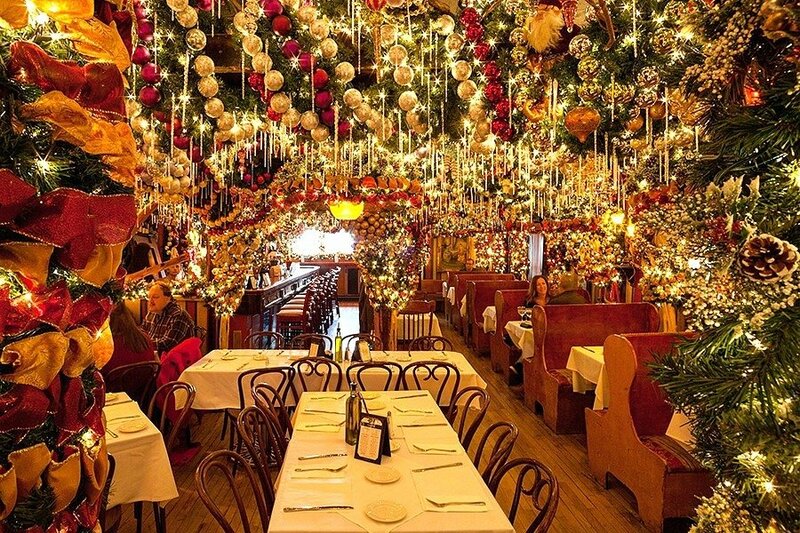 Dine at Rolf’s, the tiny German restaurant in Gramercy that goes all out with its Christmas decor.